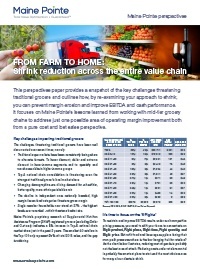 Learn how Maine Pointe can help your grocery business reduce shrink, improve margins and increase top-line sales. 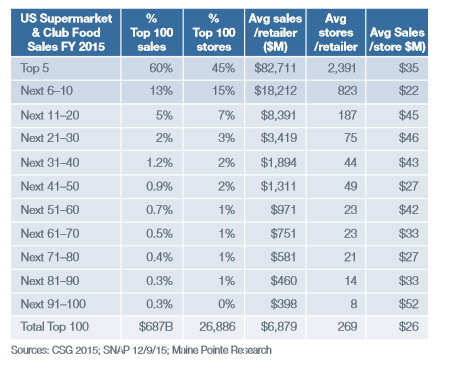 Our proprietary research of Supplemental Nutrition Assistance Program (SNAP) registered grocers (excluding Dollar and C-stores) indicated a 6% increase in top 5 national chain market share in the past two years. The smallest 90 retailers in the top 100 only represented 27% of total 2015 sales, and the gap is widening. To maintain and improve EBITDA results under such competitive pricing pressure, you need to shift your focus. It's time to concentrate on the '5 rights', right product, right place, right time, right quantity, and right price. With food and beverage suppliers facing their own profit pressures, where is the low hanging fruit for retailers? Reducing the cost of goods is probably not the best area of attack. A smarter place to start is by reducing the costs that are under retailers' control and the most obvious area for many of our clients is shrink. 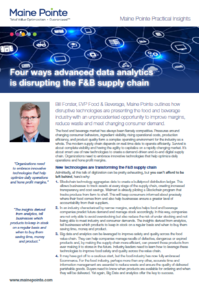 Four ways advanced data analytics is disrupting the food & beverage supply chain.